There are many reasons why many people are now going for the solar-powered lights. To begin with, the solar energy is renewable and you are only required to make a onetime investment only. By doing so, you do not have to worry about high energy bills at the end of the month. 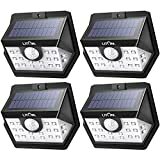 The best solar security lights also come with other exciting features such as better illumination intensity, efficiency, and Waterproofs. These models also boast of motion sensors that activate automatically, scaring off burglars and wildlife away. In this article, we are going to look at the top models available on the market. This will save you time and energy of going through the multitudinous models offered by various companies. By going through the models below, it will be easier for you to get a model that suits your needs. The Litom Solar Lights Outdoor features superior motion sensors and two powerful LED lights, which offers brighter light for added security. This makes it a perfect choice to use in homes or business premises. Thanks to its versatile design, this light creates a wider luminosity range of up to 270 degrees. It also comes with three different lighting sensing modes to fit your appropriate needs. If you are looking for a powerful spotlight for your patios, decks, steps, carpets, walkways, or balconies, this is an excellent choice. This model also doubles as a motion light thanks to the inbuilt motion sensors that detect a wider range. Additionally, this 36 LED and wide-angle design will illuminate all corners of your premises offering better security. For durability, this unit is crafted from weather-resistant materials allowing you to use it outdoor throughout the year. 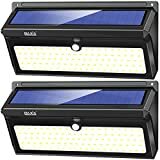 For those looking for a model that is environmentally friendly, efficient and yet powerful solar lighting built for outdoor use, this is a great choice. This unit comes with a simple installation and weather resistant construction making it a perfect addition to your house’s exterior. You will also love the strong bright light that provides maximum security. Besides, the lights are solar powered and energy efficient saving you many monthly expenses on power utility bill. 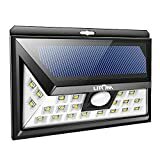 The URPOWER Solar light is a weatherproof outdoor light that is usable throughout the year to provide maximum security. The unit comes with an easy to mount design, which you can place on either the wall or ground. It features a solar-powered lithium-ion battery that charges fast and retains charge efficiently for better performance. Additionally, the unit comes with a modern design giving your home an attractive look. 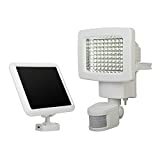 This wireless solar powered light comes with a simple design and superior performance that will fit your home as well as outdoor lighting needs. This unit comes with an upgraded 100LD solar lights that offer brighter lights for hours. We love the motion sensor that activates after thirty seconds to avoid false alarm. Additionally, this unit is made of high-quality materials that are weatherproof, making it usable both indoors and outdoors. 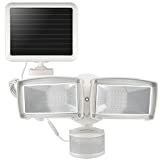 If you are struggling to repay high monthly bills on power, this solar powered light is a great choice. The unit is crafted using weather resistant materials making it a great pick for outdoor lighting. It comes equipped with great features such as motion sensors to scare off intruders. We also love the continuous working mode that provides you with sufficient outdoor lighting when you need it. 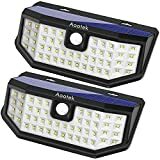 What’s more, this light has three adjustable heads allowing for wide coverage. The LEPOWER security light offers you with a welcoming light while still beautifying your home, as it doesn’t require extra electrical wiring. This model comes with strong lights that illuminate your doorway, garden, garage, lawn, as well as other places you need outdoor lighting. Unlike other models that requires you to set it on direct sunlight, this model is powered by an amorphous silicon solar panel that allows it to charge in all daylight conditions. 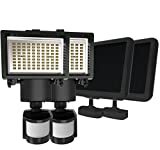 The LITOM solar outdoor lights come with upgraded PIR motion sensor that has the ability to detect up to 26 feet at 120 degrees plus a better sensing sensitivity than other models. The model also comes with IP65 waterproof that withstands all terrible weather such as a snowstorm, rainstorm, as well as hot weather. Besides this model comes with bright light and saves energy, allowing it to work for longer. While we can depend on Police for protection, equipping your home with this security light will keep your family safe and while still safeguarding your valuables at home or offices. What sets Lemont outdoor light apart from the other models on the market is its practical motion sensor and energy efficient design. This light also comes with a weather resistant and heatproof construction, ensuring a reliable service for long. Don’t compromise your home’s security and the safety of your family at night while trying to avoid high-energy bills. By installing the Sun force 82080 solar motion light, you can illuminate all the treacherous dark corners, maximizing the security of your home as well as your family’s safety. This 80LED solar light also boasts of motion sensors that automatically activate when motion is detected. What’s more, this unit comes with an amorphous solar panel that charges three rechargeable batteries ensuring reliable lighting.